Pea Salad with Zippy sauce is a family favorite and this is a great spring salad that pairs nicely with ham. The addition of French green beans & baby limas really add texture and zing to the salad. I think I may have to serve it at Easter! It is a super simple oldie goldie that I think you will like! Mix well and adjust seasoning to taste. This entry was posted in salad and tagged Salad. Tuna Salad, I know doesn’t seem all that special but, really this is a delish recipe. Perfect for lunch or a quick weeknight dinner. The mix of the sweet pickles, the salty parm, the crunch of the broccoli slaw, it hits all the senses! YUM! Drain, dump & flake tuna, add slaw, eggs, pickles, seasoning and mayo; stir and chill. I love this on toasted wheat bread. ENJOY!! 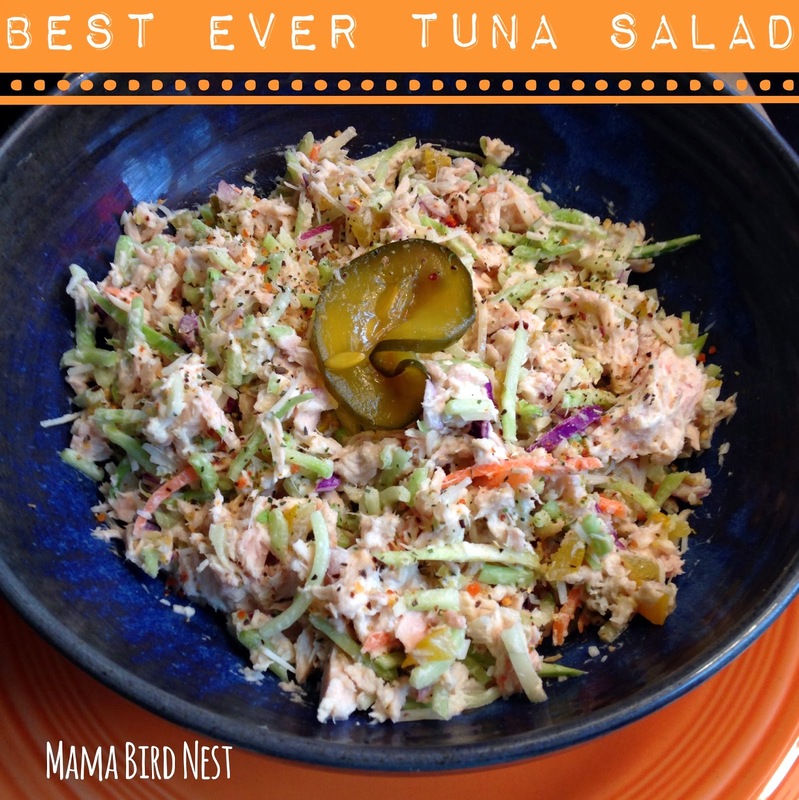 This entry was posted in tuna salad, Tuna Salad with Brocoli Slaw and tagged Best Tuna Salad, Mama Bird's Nest, Retro Rad, Salad. Seven layer salad is one of my favorite salads ever! It’s so old school and was served and nearly every family function as a child. It holds lots of memories for me. Like when I was little I only ate the hard boiled eggs and the bacon! It is a very simple dish, just chop everything and put together. There is one key element to this salad, YOU MUST MAKE AHEAD!! I always make the night before and it really needs the time to set and all the flavors to meld. I promise this is a crucial step! Mix all the dressing ingredients together and set to side, it should be kind of thin at this point like salad dressing, not watery! * If you use a sweet mayo like miracle whip you do not need to add the sugar! I like to add a tablespoon at a time and taste! You can always add more! To layer salad, I love to do in a big giant bowl and I do 2 layers! Start with lettuce, pepper, onion, celery, peas, eggs, repeat. Then top with dressing, cheese, bacon crumbles and chives. Cover and refrigerate over night. 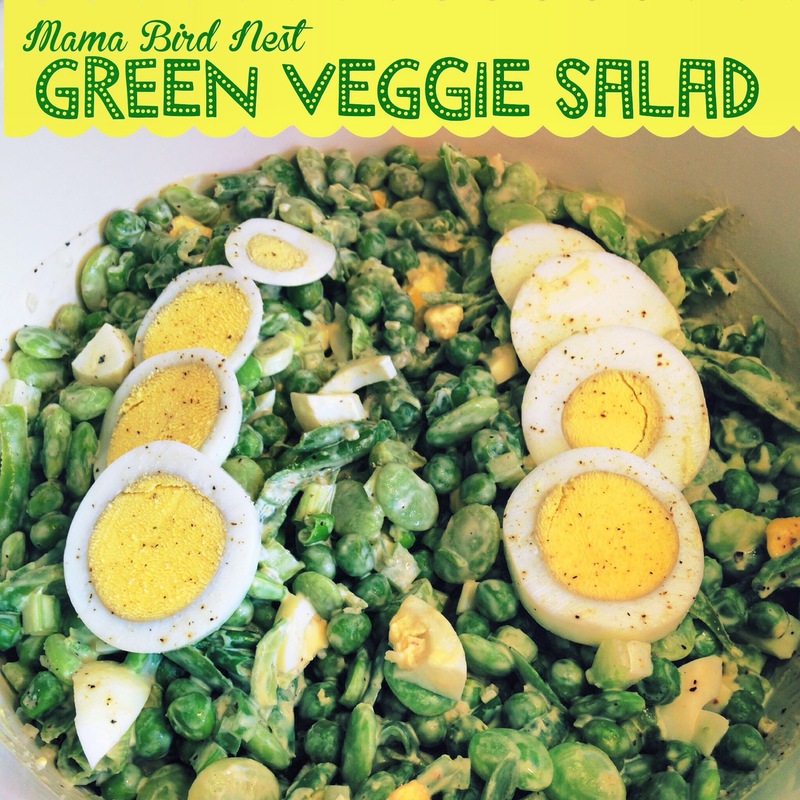 This entry was posted in veggies and tagged 7 layer salad, Mama Bird Nest, Mama Bird's Nest, Salad, Salad Dressing, seven layer salad. 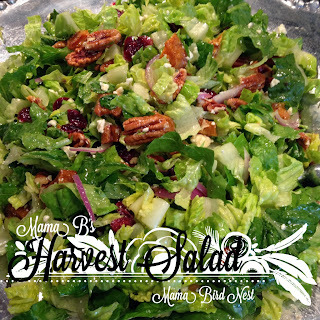 Mama B is the sweetest Gran to my favorite 4 yr old twins, Jake & Maggie, Mama B is also great cook and she was telling me about this amazing salad that I thought would be a great addition to our Thanksgiving meal! I love roasted sweet potatoes so I made a smaller portion for dinner last night and it was FANTAB!! Hubs gobbled it up and so did I!! Peel and cut sweet potatoes into 1 inch pieces. Toss sweet potato chunks in mixture of oil, garlic and salt. (I put the chunks into a plastic bag, just drizzled some oil in, threw in 2 cloves sliced garlic and massaged it all together.) Roast in a 400 oven for 30min or so Potatoes should be golden brown in color. Cool. Chop romaine lettuce into 1 inch pieces and place in bowl or platter. Layer onion, blue cheese, cranberries, and pecan pieces. Top with sweet potato chunks. Toss salad with desired amount of vinaigrette dressing right before serving. (You have to eyeball how much dressing – when I doubled the recipe about ¾ cup of dressing worked perfect!! Thanks Mama B for sharing!! This entry was posted in Uncategorized and tagged dressing, Mama Bird's Nest, Salad, sweet potatoes, Thanksgiving. I say this every year, but seriously HOW IN THE WORLD is THANKSGIVING in 2 1/2 WEEKS??? Really? How? How fast can the time fly by? THANKSGIVING is upon us!! You ask WHAT in the world am I planning on serving? Well, I have a list of traditional favs that I have put my own little twist on to make perfect and I am sharing all my yummies today. No Thanksgiving is complete without and AMAZING Bird. Thanks to Aunt Jan, who made the rub for the first ever fried turkey I had that I am sharing the TOM TERRIFIC TURKEY RUB it is sure to be a HIT! And last year I did a BRINE and OMG it was insane! So moist and yummy!! Cranberry Orange Pineapple Salad is to DIE for and everyone, even Hubs who claims to hate any sort of gelatin loves this!! Birdie’s Best Ever Dressing really is the BEST EVER! I worked on this recipe for about 5 years and it is PERFECT!! Brussels Sprouts, I know everyone turns up their noses but, they are DELISH!!! Follow these easy steps and even your picky bro-in-law will gobble them up!! Mama B’s Salad roasted sweet potato, greens, cheese, you can not go wrong!! What are you serving this year for Thanksgiving? This entry was posted in TURKEY and tagged Mama Bird's Nest, Salad, side dish, Thanksgiving, Thanksgiving Menu. Yet again my girl Jenny from Dinner, A Love Story has been a true inspiration for an amazing dinner!! Jack was with his cousins tonight so I thought I would make the Hubs and I a special dinner. I whipped into Dockside Seafood and saw these beautiful scallops! I remembered reading about a scallop dish with a bacon and corn hash and that was where I began!! I had 2 ears of silver queen corn in my fridge along with some fresh spinach, grape tomatoes, Vidalia onions and of course BACON! So here is where I got crafty! I grabbed my iron skillet and fried up 2 pieces of bacon. Set the bacon aside and added a pat of butter, seared the big ole scallops on all sides about 2 mins on each side as these were large scallops. While they were searing I cut the corn off the ears, diced 1/2 of onion, cut tomatoes in half. Remove scallops from skillet cover with foil. Add corn and onion, sauté about 3 mins add tomatoes and splash of white wine and lemon juice, swirl around and get all the yummy goodness from the pan add spinach allow to wilt about 2 mins add scallops back to pan and then serve up, no joke 20 minute meal. Delish!! This entry was posted in Uncategorized and tagged 20 min meal, A Love Story, Dinner, Healthy, Mama Bird Nest, Mama Bird's Nest, paleo, Salad, scallops, seafood. Yummy Fruit Salad, yummy, yummy! This salad is so simple it seems almost silly to share, but it was so dang good I would be remiss not to! Cut up all the fresh fruit you enjoy and pour this deliciousness over top, it will bring out all the juices from the fruit and make them look all shiny and beautiful! I used cantaloupe, strawberries & blueberries. Whip it up, pour it over your fruit and something magical happens! This entry was posted in Uncategorized and tagged fruit, fruit dip, fruit salad, Mama Bird Nest, Mama Bird's Nest, Salad, Salad Dressing, summer. My FAMOUS (even if only in my own mind) Broccoli Salad. This is one of my favorite salads! I love the freshness and it is perfect for a Southern family dinner. The trick to MY salad is that you blanch the broccoli to bring out the bright green color and to lightly cook. It is still crisp just more tender. Hope you enjoy it as much as I do! Blanch broccoli for 2-3 mins, remove, and submerge in cold water. Once cool add red onion and raisins to broccoli. Mix dressing and pour 1/4 to 1/2 onto broccoli mix and chill. Just before serving add almonds & crumbled bacon and additional dressing (if needed). Makes a great addition to any spring or summer meal. Enjoy! This entry was posted in Uncategorized and tagged broccoli, broccoli salad, Easter, Mama Bird Nest, Mama Bird's Nest, Salad, Salad Dressing, spring. I have been on a quest since eating at The Boat House in Charleston, SC to find a recipe for this yummy slaw. I have tried a few and non were quit right.UNTIL I found Katie who ironically lives in Charleston but, loves CAROLINA TARHEELS! I have been making this slaw for years now and thought it deserved its on post! Whisk mayo, honey & vinegar until even consistency. Add blue cheese, & salt/pepper. Toss the coleslaw mix with the sauce. Chill for at least 2 hours. Top with crispy bacon. ENJOY! This entry was posted in Uncategorized and tagged blue cheese, blue cheese cole slaw, cole slaw, greens, Mama Bird Nest, Mama Bird's Nest, Salad, Salad Dressing, slaw, The Boat House.